At any time, the player may smooth sand or soil in a hazard provided this is for the sole purpose of caring for the course and nothing is done to breach Rule 13-2 with respect to his next stroke. If a ball played from a hazard is outside the hazard after the stroke, the player may smooth sand or soil in the hazard without restriction. 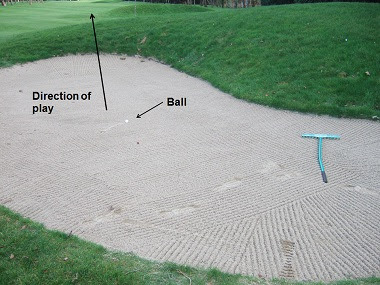 This means that in the photo above a player may walk into the bunker to pick-up the rake, smooth the area where the rake was lying, smooth footsteps and other irregularities as they leave the bunker, lay the rake down and then make a stroke at their ball in the bunker. The only restrictions are that they must not do this if their purpose is in any way to test the condition of the bunker and they must not improve the position or lie of their ball, the area of their intended stance or swing or their line of play. In short, do not make the mistake of raking any sand between your ball and the hole. Christmas is coming and many of you will be buying tablets or other digital devices for friends and family. Why not surprise them with a copy of my eBook, ‘999 Updated Questions on the Rules of Golf 2012 -2015’. You can buy it direct from Amazon, but if you purchase direct from my web site, at the same low price, I will provide you with two downloadable files; a pdf file (which can be read on all computers) and a Mobipocket file (which can be read on Kindles, iPads, Blackberries, smart phones and other compatible digital devices). Click here for details. Thanks so much for the newsletters, as I thoroughly enjoy them. Are there any rules that relate whether a rake should be left in or out of a bunker, as where I live in Japan, they always leave them outside, which doesn't seem quite right somehow? Q. Should rakes be placed in or outside bunkers? A. There is not a perfect answer for the position of rakes, but on balance it is felt there is less likelihood of an advantage or disadvantage to the player if rakes are placed outside of bunkers.